*This post is sponsored by DAP Products and The Home Depot. I have been compensated for my time and provided with product or payment in exchange. All opinions are my own. This post contains affiliate links. I thought I was pretty much done building furniture for my house and then the other day I went to put away some of my twin boys' laundry. 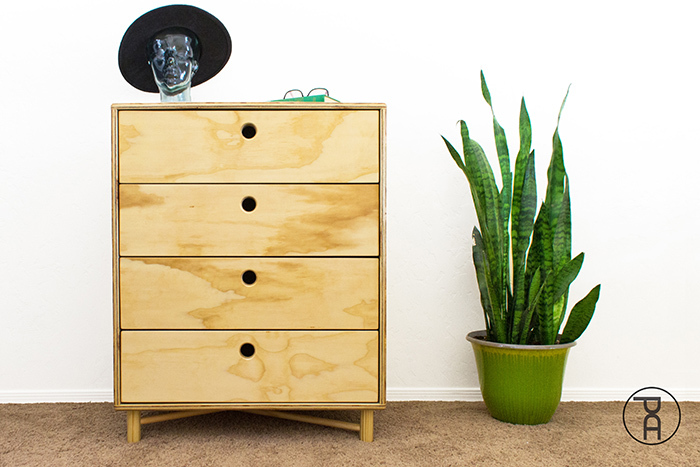 I built them their modern dresser/bookshelf combo a couple years ago and it's still going strong! (one of my favorite builds to date btw). But, I had totally forgotten that we placed a crappy little particle board 3-drawer unit in the closet for a little extra storage. It was an inexpensive hand-me-down and as you can imagine, after 9 years of abuse from two very active little boys, that little piece of junk was on it's last legs. I sketched up a simple design for a new dresser which would offer more storage, but still fit within the same tight space inside the closet. I'm still on a round-over kick after building my stair tread armchair a few weeks ago, so I decided I needed to work in some dowel legs and round finger holes. Check out the build video to see how the whole thing came together and keep scrolling for the full building plans. 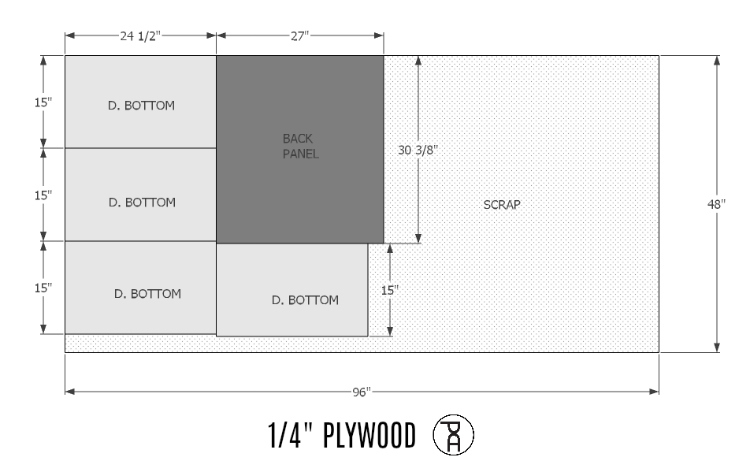 DAP PlasticWood with Latex in "Natural"
(2) 3/4" plywood @ 18" x 29-5/8"
(2) 3/4" plywood @ 18" x 27-3/4"
(8) 3/4" plywood @ 5-7/8" x 14"
Begin by cutting all the parts on the materials list, except the pieces marked "APPROX." 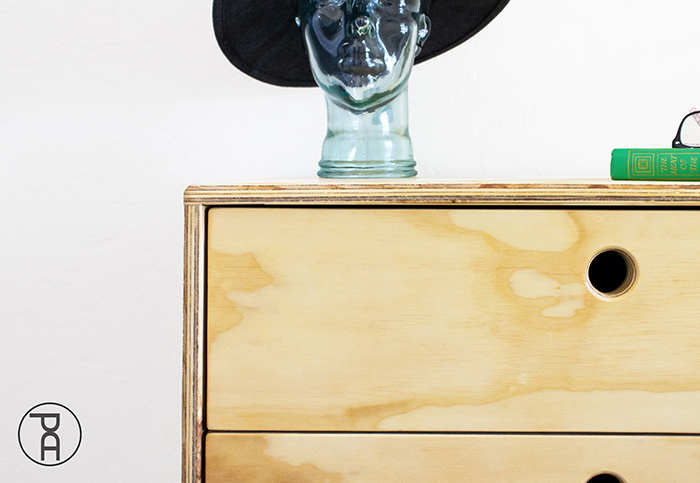 Those dimensions will be based on the exact assembled dimensions of your dresser frame. 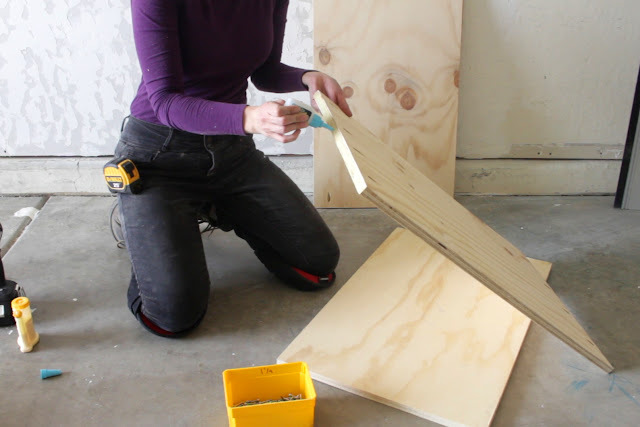 You can use a circular saw or even a track saw to break down the plywood sheets into individual components, but for a project with multiple repeated cuts like this one, I recommend using a table saw. 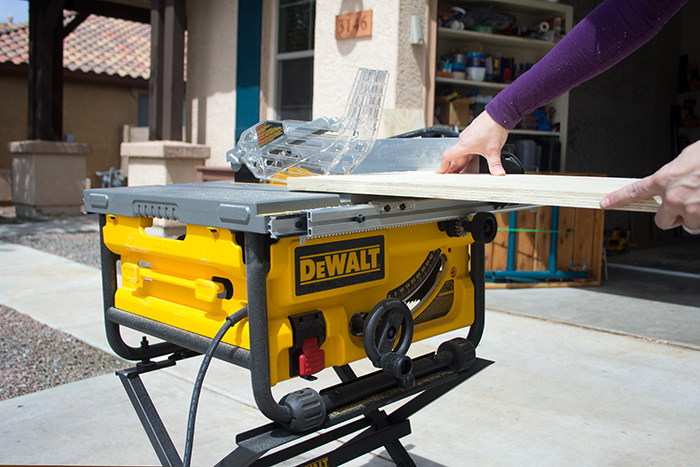 I used the DEWALT 15-Amp 10" Compact Job Site Table Saw for this build and it worked like a champ! The motor was more than powerful enough to slice through the plywood and the Site-Pro Modular Guarding System made getting accurate cuts really simple. 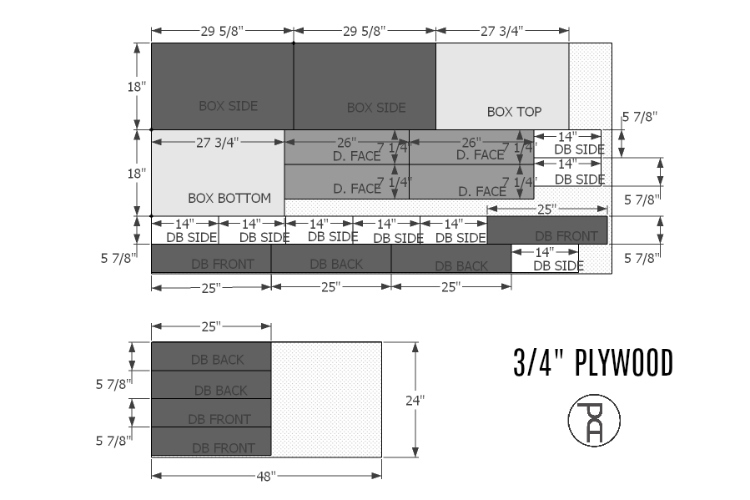 Attach the 18" x 27-3/4" frame top and bottom panels to sides using glue and 1-/4" screws through 3/4" pocket holes. Use a measuring tape to check opposite corners to ensure the box is square. 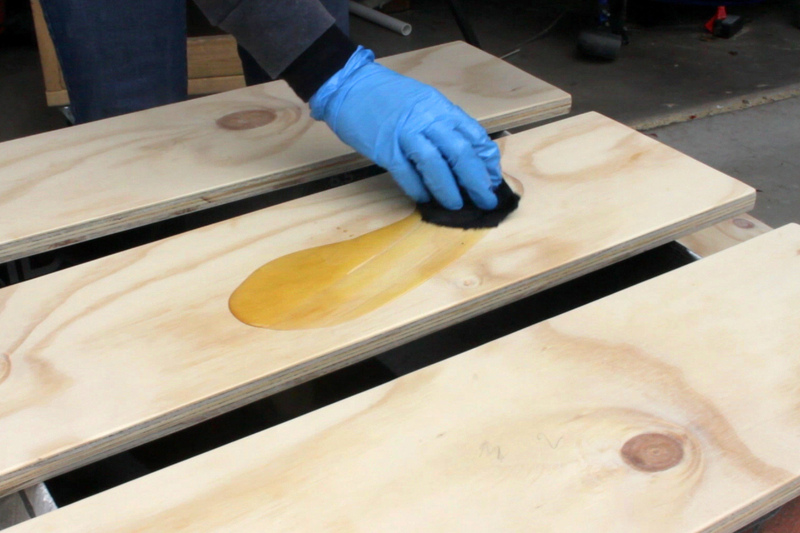 I've got a tip for gluing wood panels together when you're in a hurry. Apply your regular Carpenter's Glue to the adjoining faces, then add a few drops of DAP RapidFuse quick setting adhesive. The RapidFuse sets completely in 30 minutes, holding the boards together while the Carpenter's Glue fully dries. I've found it allows me to remove the clamps a couple hours early. 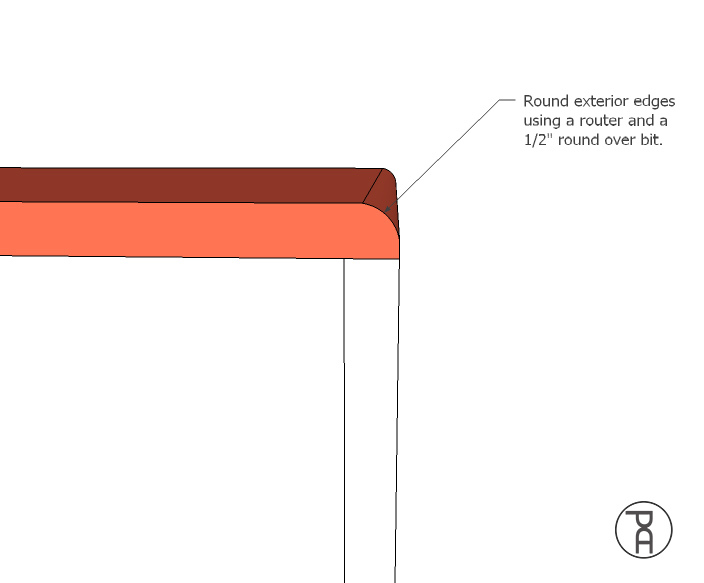 Round exterior edges of the box using a router and a 1/2" round over bit. 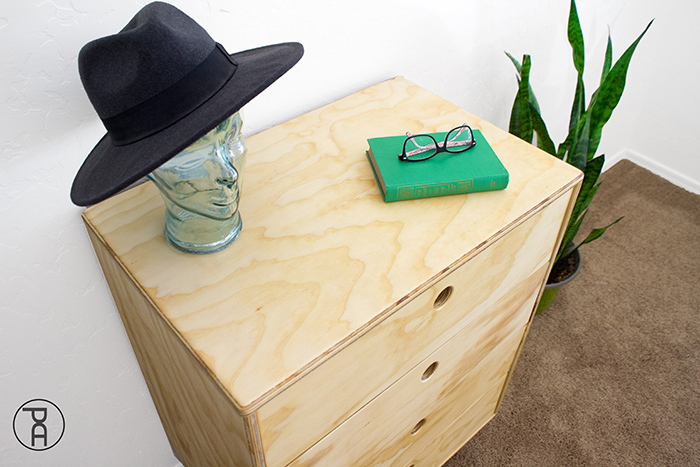 Using a circular saw or table saw, cut a back panel from 1/4" plywood to fit over the back side of the frame. 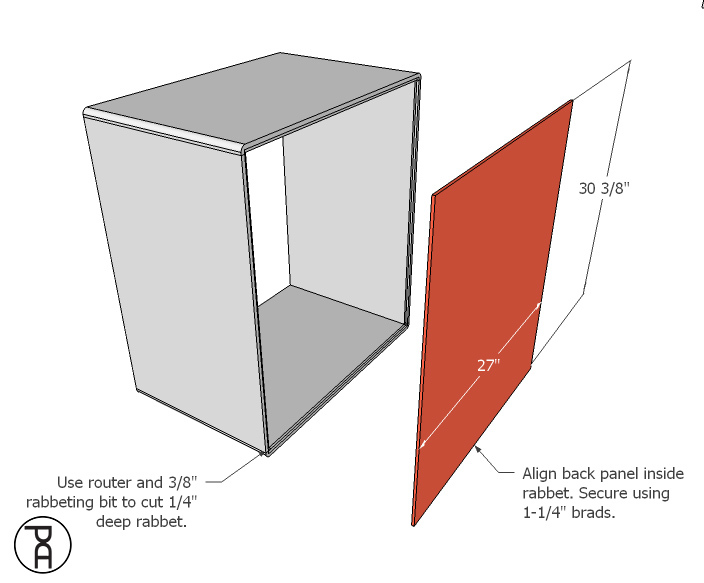 If you want the panel to be less visible from the side, use a router and 3/8" rabbeting bit to cut 1/4" deep rabbet around the inside perimeter of the frame. Align the back panel inside the rabbet. Secure in place using 1-1/4" brads. Cut four, 4" legs from 1-3/8" dowel. Find the center of the ends. Draw a vertical line down the side of each leg. I tried using a speed square and even my Kreg Multi-Mark but was still struggling to get my lines perfectly perpendicular to the top edge. 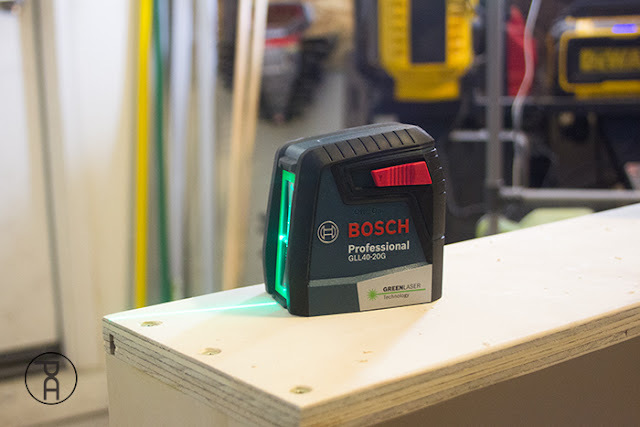 I finally came up with the idea to use my new Bosch Self-Leveling Cross Line Laser with VisaMax Green Beam. 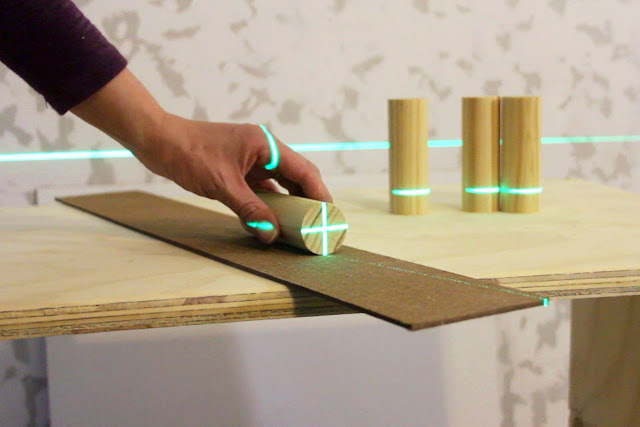 I simply set up my laser pointed at the center of the end of each dowel. The intense green beam is 4 times brighter than standard red lasers, so it was easy to see, even during the day. I then used a pencil to mark where the cross-hairs hit, ensuring my lines were perfectly 90 degrees from each other. On two of the legs, measure 2-1/4" from the top edge. On the other two, measure 2-1/4" from the bottom edge. 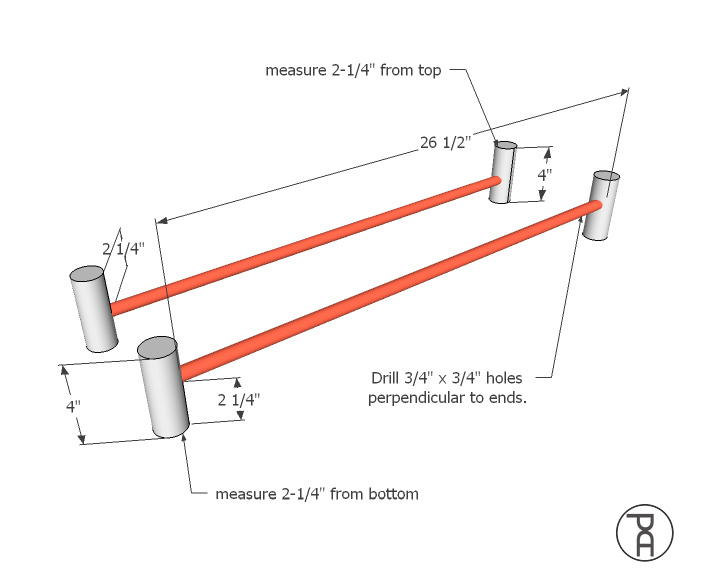 On each mark, drill a 3/4" x 3/4" hole. Cut two 28" lengths of 3/4" dowel. 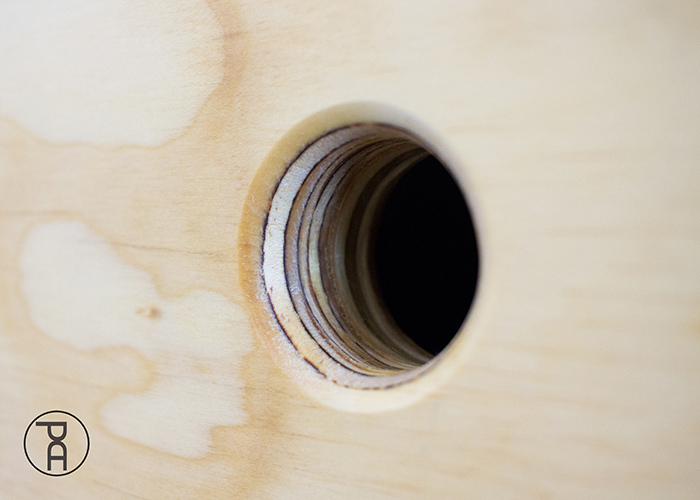 Apply wood glue to the holes and insert dowels. Clamp together and allow to dry. 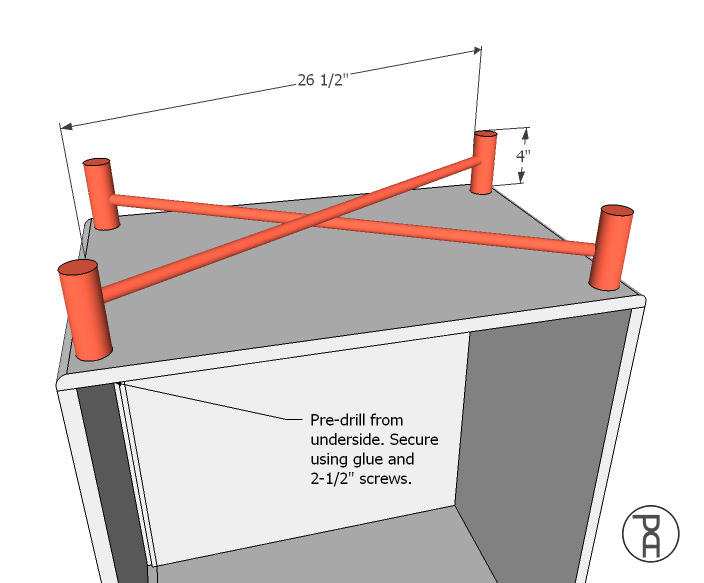 Pre-drill through the plywood bottom of the frame and into the legs from the inside of the box. Secure in place using glue and 2-1/2" screws. 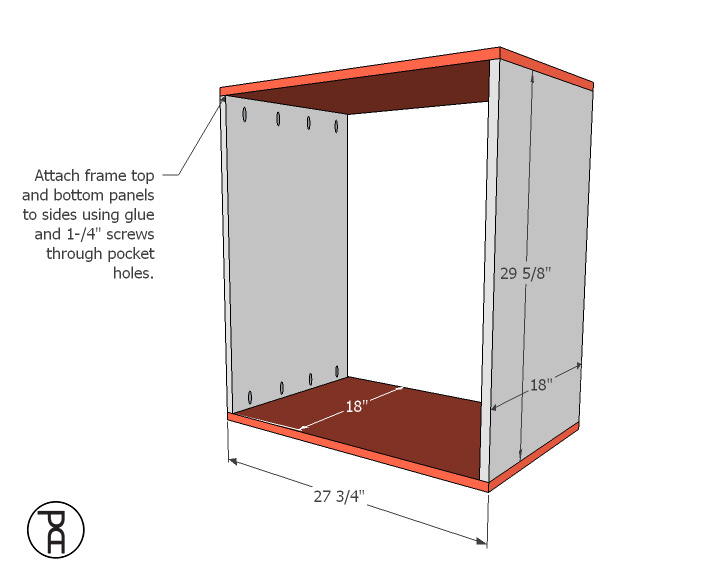 Draw boxes are a little finicky and need to be built to fit the exact measurements of the frame opening. 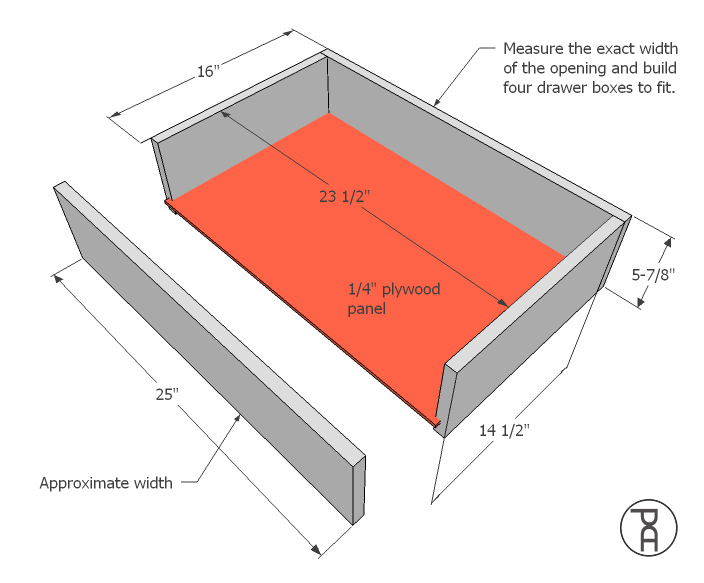 Measure the exact width of the opening and build four drawer boxes to fit. 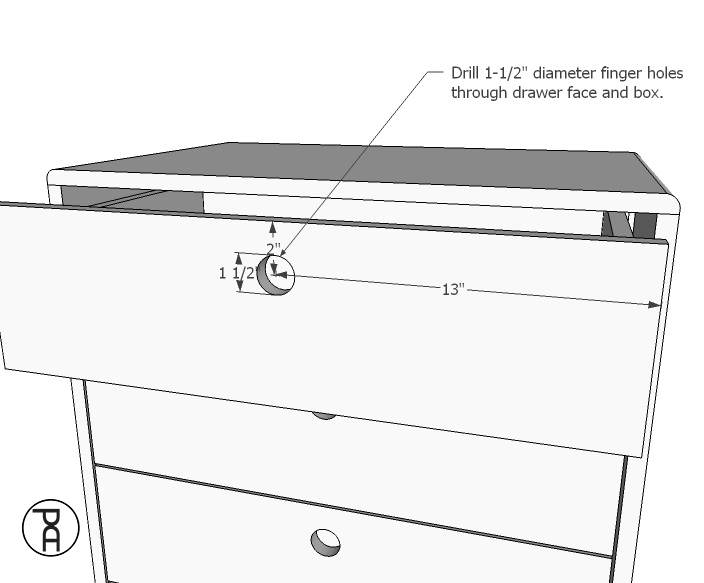 There are several different techniques for building drawer boxes, depending on the tools you have and your skill level. 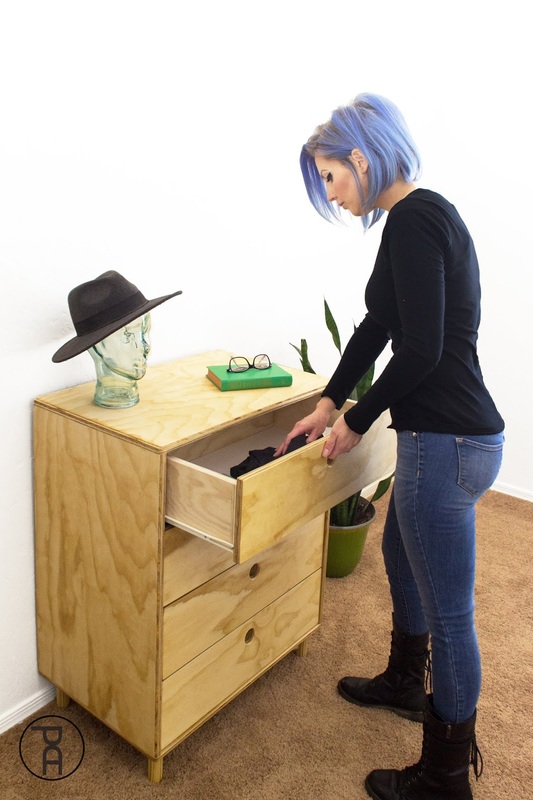 Instead of reinventing the wheel and telling you how I build drawer boxes, I recommend you check out this great tutorial from my friend Jen at Build-Basic. 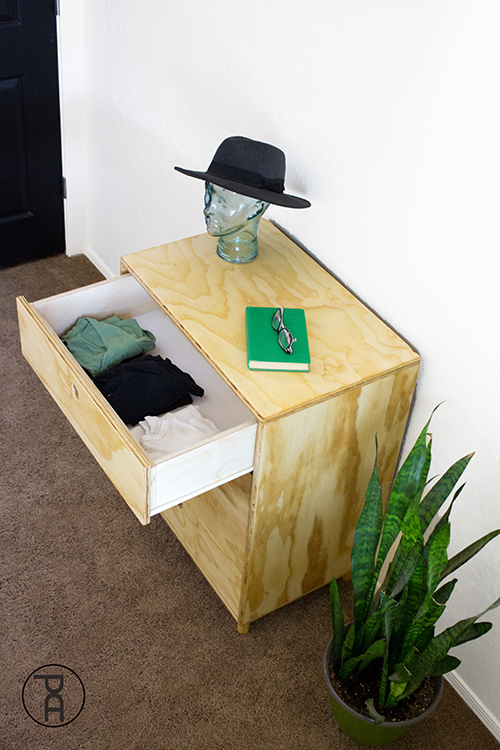 Install four assembled drawer boxes inside the box opening using 16" side-mount drawer slides. Measure the width of the frame opening. Subtract 1/4" from the measurement (1/8" from either side). Cut four drawer faces from the remaining plywood. 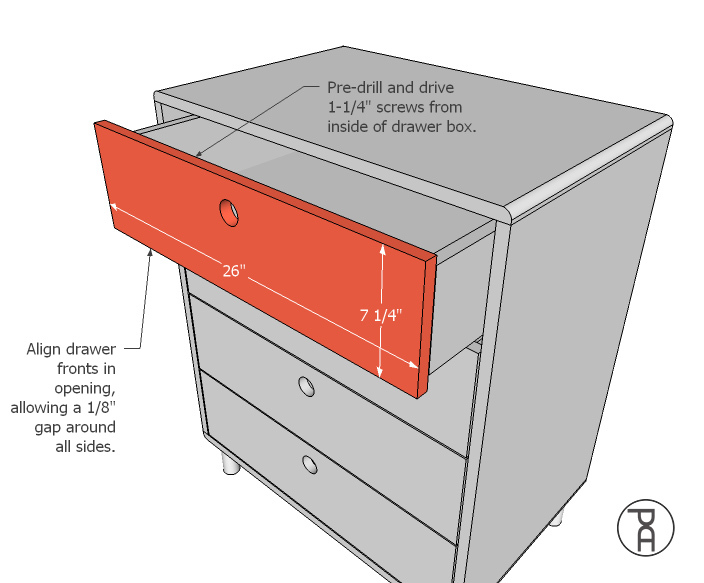 Measure 2" from the top edge of of each drawer face and find the center from the sides. 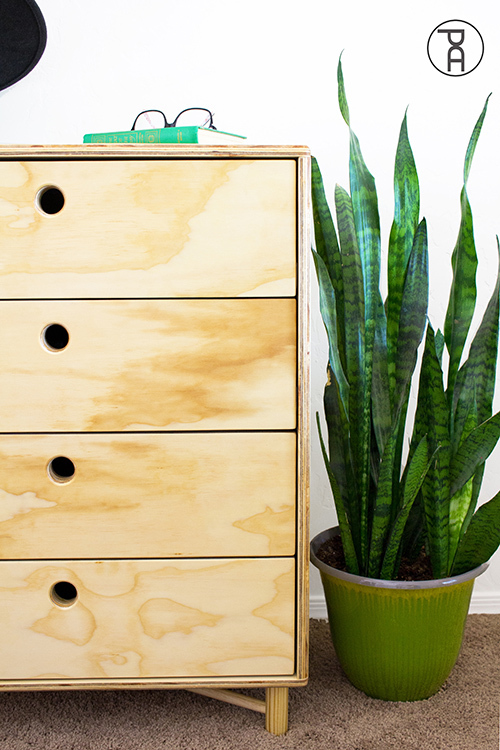 Use a forstner drill bit to bore a hole through the face as well as the front of the drawer box. The inside of holes was a little rough after drilling, but that was easily fixed with a little love from my Dremel. 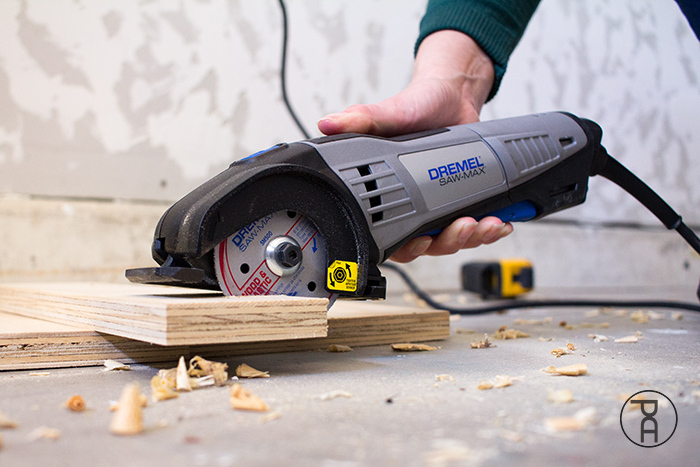 I used my cordless Dremel 8200 series variable speed rotary tool with a sanding drum attachment. The sanding drum I used is part of an 18-piece tool accessory set, so I had multiple sizes and grits to work with. 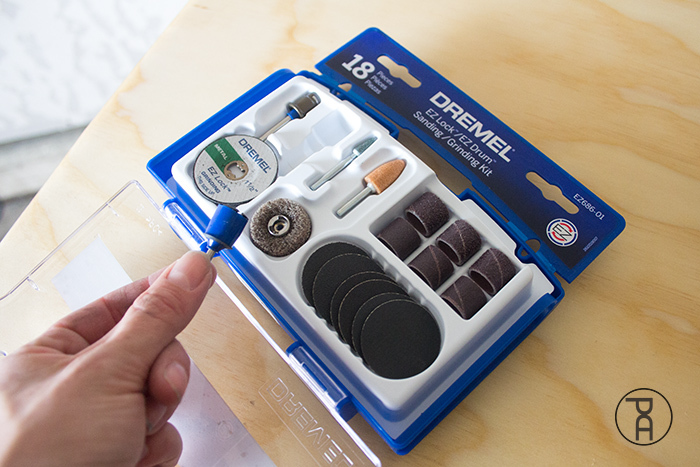 I don't know if you've looked into it, but Dremel has a MASSIVE collection of handy little tools that make all those challenging little jobs you come across much easier. A few of my favorites are the 4300 series corded rotary tool (which comes with a super cool mounted light and 40 different accessories), the Dremel Flex-Shaft attachment for rotary tools, EZ Lock Sanding and Polishing Mini Kit, and the EZ Lock cut-off set for metal and plastic. 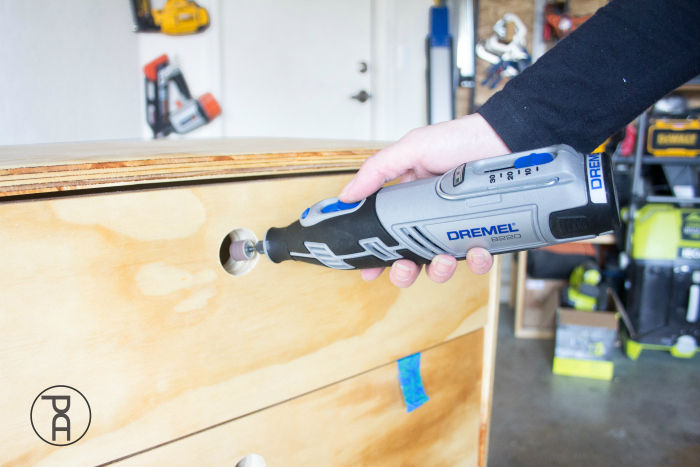 Even though Dremel is known for their rotary tools, they also make the 6 Amp Cordless SawMax, which is a powerful yet compact, handheld power saw. It's great for making accurate cuts, up to 3/4" deep, through almost any kind of material. Fill any holes, voids or defects with wood filler. 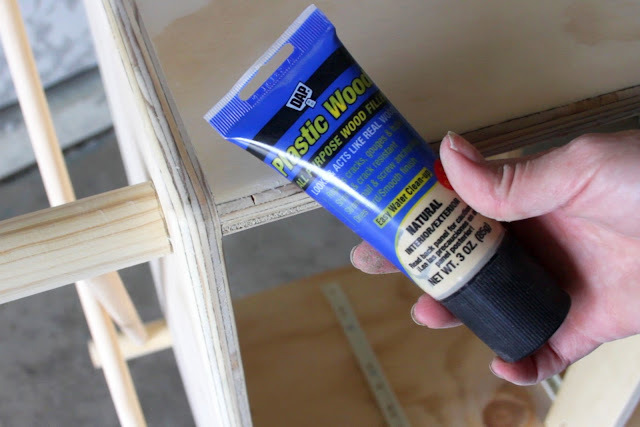 I love using DAP PlasticWood all purpose wood filler since it is water-soluble, easy to spread and dries quickly. It also contains latex, which makes it crack and shrink resistant. When I know I'm not going to stain my project, I prefer to use pre-colored wood filler. It tends to match much better than the standard "stainable" base. I discovered the PlasticWood color "natural" matched the pine plywood I used perfectly. Sand all surfaces up to a 220-grit and wipe off remaining dust. Apply whatever paint or finish you'd like. Rounding the edges of the plywood is totally optional, but I'm glad I spent the extra time. There is something so satisfying about a rounded over hole. It just makes you want to touch it. 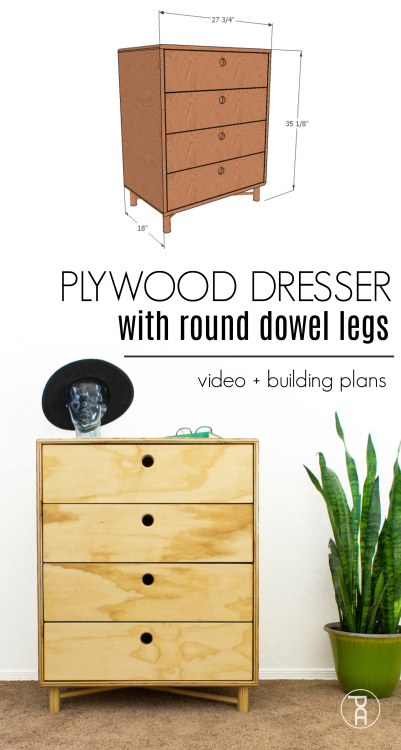 Hands down, my favorite part of the whole dresser is the round dowel base. It was so simple to put together! I'll definitely be using this design on future builds. 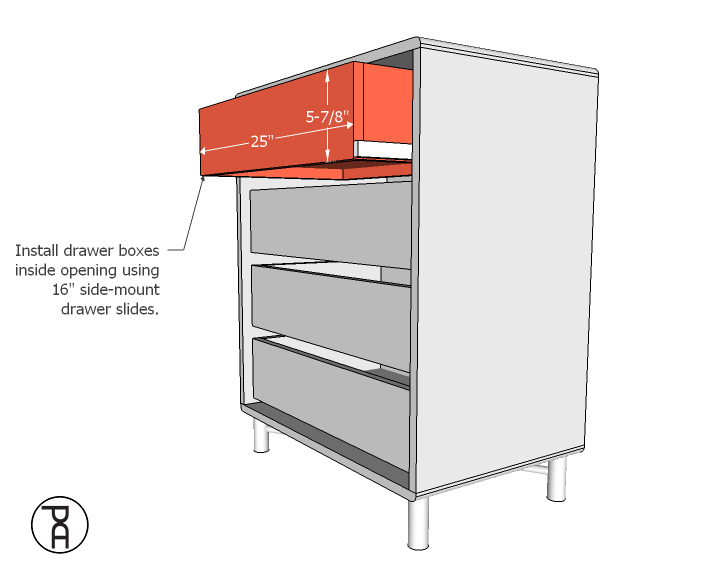 Even though they are popular, I don't like using full extension drawer slides for dressers. In my experience, they can lead to tip-over risk if you pull out more than one drawer at a time. I went with 16" side mounted Euro-style slides and I was able to pull out the top two drawers without the dresser base moving at all. I used to hate the grain pattern of pine plywood but lately it's been growing on me. Although I still love rich wood colors, I'm starting to like lighter toned wood as well. What do you think? 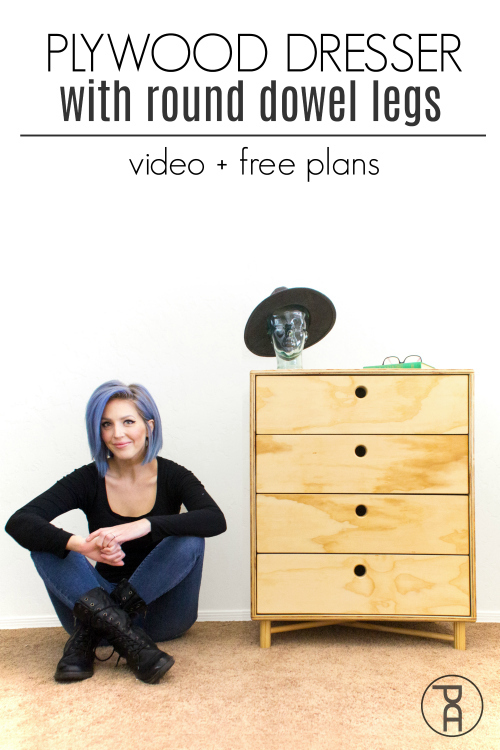 Are you ready to build your own simple plywood dresser? Feel free to pin the image below to save the idea for later! 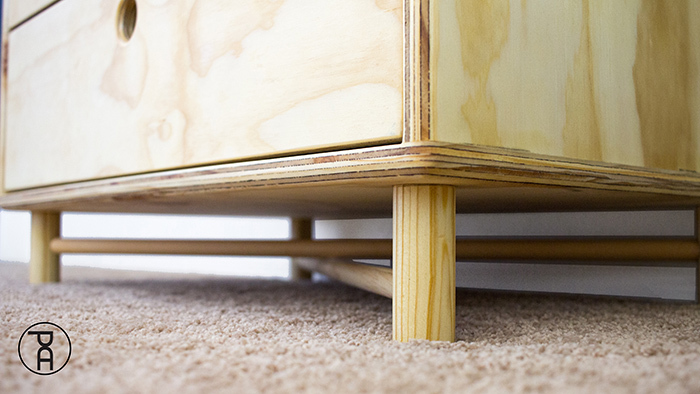 Nice build -- it's really interesting to see plywood used for furniture without edge banding. I like it!